While this table is perhaps not as dramatic as many of the tables that we’ve done in the past, it does, nonetheless have some wonderful features. 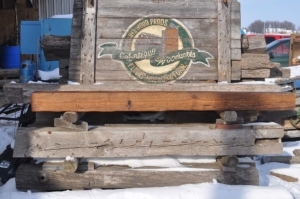 Most importantly, our customer came to us with a pile of wood from an old family barn. 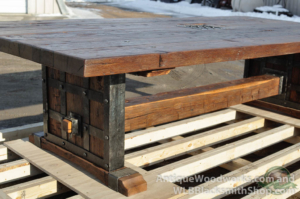 It is always wonderful to use barnwood from the old family farm to craft a new table that can last generations. The wood was classic Clear Vertical Grain (CVG) Douglas Fir flooring. It is commonly found in old houses and barns. The wood was dirty, pitted, warped, and not in particularly nice shape. (you can see the original look in one of the pictures) The original milling was off a bit too. It made us wonder if they used 2nd rate material in the barn and the 1st rate material in a house. With the wood in our shop, we dried it down in our kiln to remove any excess moisture. We then worked the wood just right so that it had a lot of neat character — reflecting the life that once was. We wanted a lot of character, but not so much that it was distracting or uncomfortable. After all, we didn’t want the customer to feel like they were eating off of the floor (even if they were). We selected just the right pieces and sanded them down by hand. We eventually got to a point where we applied our secret sauce to darken up the wood. The treatment brought out these deep wonderful mahogany tones. Finally, we applied a Rubio Monocoat finish. We buffed out the first coat and then applied a final coat. The surface is wonderfully, touchable smooth top that has a very natural, real feel. From a design and build perspective, this table is rather interesting. We wanted a thicker looking top than just a single 3/4 inch layer. While some people would suggest laminating over a fixed surface such as plywood, that approach doesn’t allow the wood to move seasonally. In Minnesota, seasonal movement is very important. So, we landed on a structure that is a typical legged table with an apron, but this one has essentially what are floor joists to support the wood top. Those joists have an interesting shape that allowed us to make the wood appear to be 2 layers (1 1/2 inches) thick when the bulk of the body is only one layer thick. The table is all classic mortise and tenon joinery. Wood pegs and glue hold the joints permanently together. The straight square legs and a relatively small overhang around the base were designed specifically to give the table a more modern feel — not overly so, but just enough. 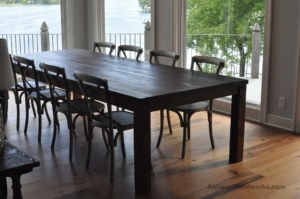 In the end, the final farmhouse table was delivered to our customer’s wonderfully remodeled house overlooking a lake — a bit of old with a bit of the new.